The Class of 2015 in the Long Beach Unified School District earned a record $96 million in scholarships and grants. The total of $96,087,625 is about a half million dollars more than the previous record set last year and represents more than a five-fold increase since 2007. Poly High School/PAAL students earned $36.5 million, surpassing last year’s school record by $6 million. Nearly $24 million of Poly’s scholarships are for athletics. Individual awards included $387,000 from the U.S. Air Force Academy, $350,000 from the U.S. Naval Academy and four awards of more than $268,000 each from USC. Other top school acceptances included Stanford, Yale, Vanderbilt, Cornell, Columbia, Georgetown, Tufts, Northwestern, Johns Hopkins, William and Mary, Notre Dame and almost all University of California schools. Wilson Classical High School students earned more than $24.3 million, up $1.4 million over last year’s school record. Individual awards included $240,000 from Cornell, $170,000 from the Virginia Military Institute, $139,000 from UC Berkeley, and $124,000 from Princeton. Other top school acceptances included Georgetown, Rensselaer Polytechnic, Duke, Brandeis, Boston University, George Washington, Tulane, Bucknell, Emerson College and Bard College. Millikan High School students earned $10.1 million, including a full ride to UC Berkeley, and four CSULB President’s Scholarships. Other top admissions included Vanderbilt, Cornell, Boston University, Williamette, Harvey Mudd, University of Rochester, West Virginia University, Penn State, Rensselaer Polytechnic, Lewis and Clark, Regis, Spelman, University of Puget Sound, Chapman, Mount St. Mary’s, Loyola Marymount, Iowa State, Westmont, Duke, Emory, Northwestern, Dartmouth, Columbia, Embry-Riddle Aeronautical University, Howard, USC, University of Oregon, University of Delaware, University of Washington, Seattle University, Fordham, University of Hawaii, University of Wisconsin, University of New Mexico, University of Chicago, Texas Southern University, University of Miami and Virginia Military Institute. California Academy of Mathematics and Science students earned $10.1 million, including individual awards of $260,000 from Tulane University, $256,800 from Haverford College, $206,920 from Kalamazoo College, $245,800 from Middlebury College, $231,000 from Williams College, $214,000 from Amherst College, $211,000 from Bowdoin College, $207,000 from Reed College, $191,000 from Middlebury College, and $166,000 from Boston College. Other top admissions included Harvard, the Olin College of Engineering, Johns Hopkins, Northwestern, Columbia, USC, Yale, Wellesley, Amherst, UC Berkeley, UCLA and UC San Diego. Major awards included eight UC Chancellor’s Scholarships, two UC Regents scholarships, three Gates Millennium Scholarships, an Edison International Scholarship, nine National Hispanic Scholars and 16 National Merit Scholars. Lakewood High School students earned $9.1 million. Students will attend 40 different colleges and universities in 23 states and the District of Columbia, with 175 attending Cal State schools and 45 attending UC schools. Athletic scholarships were awarded in baseball, soccer, cross-country, track, softball, volleyball, football and rugby. Top school acceptances included the U.S. Air Force Academy, most UC campuses including Berkeley and UCLA, Carnegie Mellon, Middlebury College, Culinary Institute of America, New York University, University of Arizona, Arizona State, Seton Hall, New York Conservatory for Dramatic Arts, Howard, Tuskegee, Weber State, Georgetown, University of Hawaii at Manoa, Louisiana Tech, Loyola Marymount, Woodbury, Mount St. Mary’s, University of Oklahoma, University of Utah, Kansas State, University of La Verne and Biola University. Cabrillo High School students earned $3.4 million, including the CSU President’s Scholarship, Olendorf Music Scholarship, UCLA Achievement Scholarship, Tuskegee University Merit Scholarship and National Pacific Islander Education Network award. Other top school acceptances included UC Irvine, UC Riverside, UC Davis, UC San Diego, UC Merced, Miles College, University of Colorado, University of Denver, all CSU campuses, Syracuse University, Cal Baptist, University of the Pacific, University of Nevada and University of Arizona. Jordan High School/Jordan Plus students earned more than $1.1 million, including the Gates Millennium Scholarship and the Frederick C. Branch (Marine Corps) Scholarship. Top school acceptances included UC Berkeley, UCLA, UC Santa Barbara, UC San Diego, UC Irvine, UC Merced, Tuskegee, Loyola Marymount, BYU, and 11 CSU campuses. Avalon High School students earned $769,350, including a $40,000 Edison STEM Scholar award. The class of 50 seniors on Catalina Island gained admission to Cornell, UC Berkeley, USC, Barnard College of Columbia and other schools. Renaissance High School for the Arts students earned $580,950 and admission to 18 CSU campuses and six UC campuses. Other top admissions included Oregon University, Iowa University, Azusa Pacific University, Art Institute, Biola University, Chapman, George Washington, Ohio State, Gordon, Reed, Laguna College of Art & Design, Langston, Tuskegee University, University of Tulsa, Musician’s Institute and Manhattanville. Educational Partnership High School students earned $38,000. Beach High School students earned $29,000. Students districtwide also earned hundreds of non-monetary honors including Rotary Service Above Self, Most Inspiring Student, Eagle Scout and State Seal of Biliteracy awards. 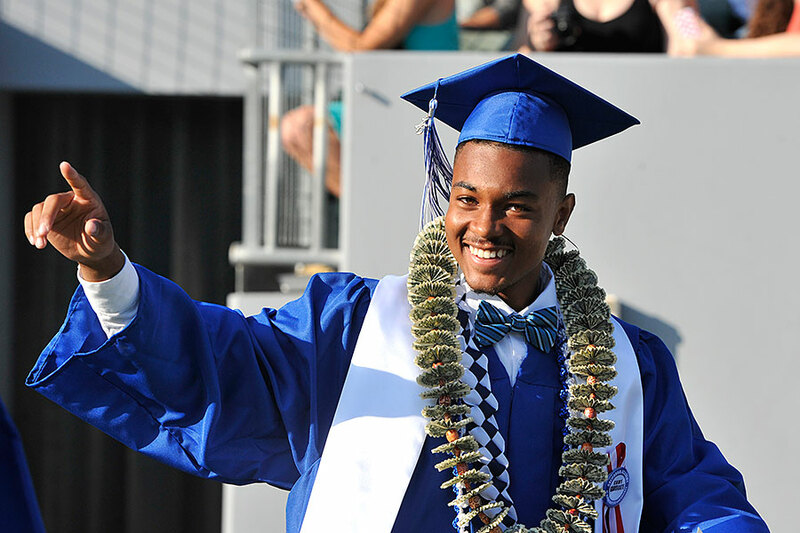 CLASS OF 2015 – A student celebrates during graduation ceremonies at the California Academy of Mathematics and Science. CAMS students earned more than $10 million in scholarships and grants.